Our Smoked Salmon really is a work of art, we have adopted a very old fashioned, successful method of dry curing and cold smoking the fish. We pay a lot of attention in sourcing our salmon to ensure we get the best quality from the best salmon farms. Our farmed salmon comes from only four, ethical and recognised salmon farms based in Scotland, the Shetlands, Orkneys iIsles and Loch Dawart. These fish farms pride themselves on quality of their fish, allowing them adequate room and freedom to grow. They are grown in the strong tidal currents of the Scottish waters and are fed with premium, non-modified foods. 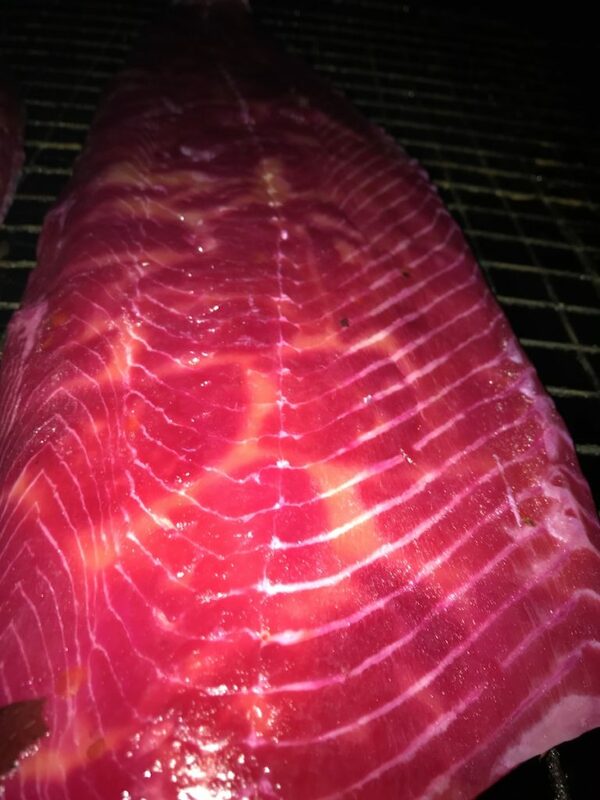 The other type of Salmon we sell, is the Wild Irish (when we can obtain it) and Wild Alaskan. Both of which are a real treat as these fish have never seen any artificial food and have lived solely in the wild. The flavour difference of a wild fish is much stronger, with a greater depth of flavour than those of their farmed cousins. We dry cure our fish using traditional methods and cold smoke them using an aged old traditional method, using a mixture of ash and oak wood. We feel this gives the fish a more subtle flavour than just using oak. The entire process of curing and smoking can take several days, the fish are then trimmed and hand sliced ready to be packed in our shop. 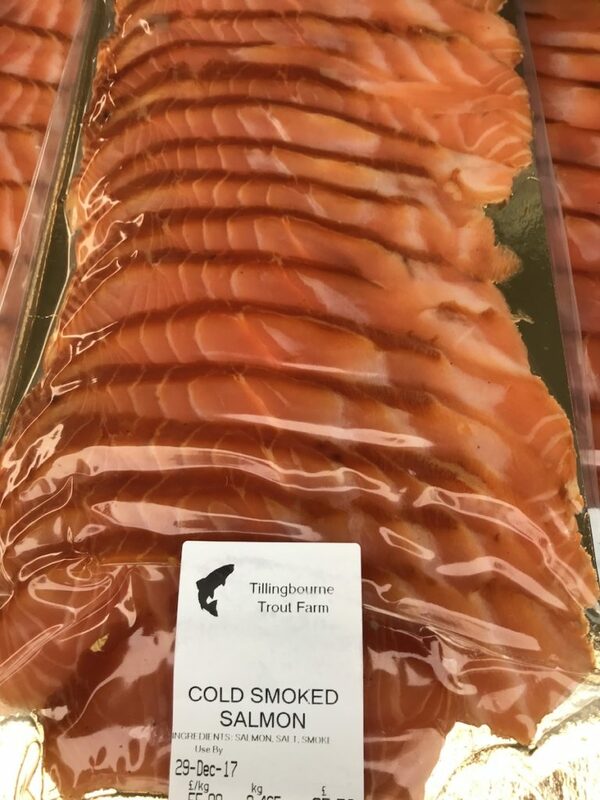 We sell Smoked Salmon in 100 grm packages, vac packed to retain the freshness and shelf life. Although we never advise freezing Smoked Salmon as this affects the taste, a vac packed product gives you the best results when freezing. You can also purchase Salmon as a whole side, either sliced or unsliced. If you pre-order we can package sliced smoked salmon to any size. We take our Smoked Mackerel very seriously as it’s often portrayed as being a very hard and dry product with little taste, like those mass retailed in the supermarkets. We source our Mackerel from various fish markets throughout the UK, including our own south coast during in the summer. 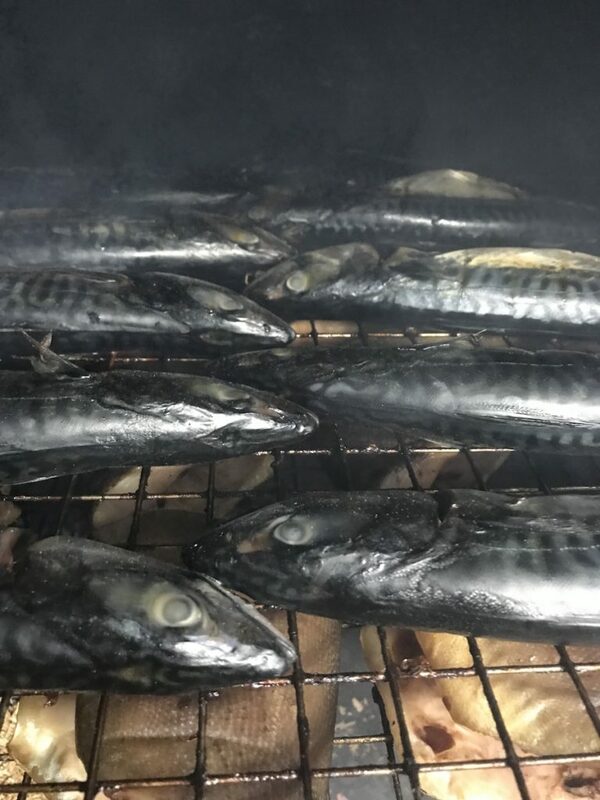 The Mackerel is filleted as soon as we receive it, brined in a salt water solution and then hot smoked in our unique way the same day. Once cooled the Mackerel is packed on the same day to ensure it remains as moist as it was when it first left the smoker. The benefits of buying our Mackerel is that there are no added colours, artificial flavours or preservatives. You will receive a delicious, moist, soft fish that’s full of omega 3 oils and tastes great. You can do many things with Smoked Mackerel, whether in a sandwich or a salad, processed into pate or added to a quiche – all are delicious. It’s holds its own on a fish patter and is perfect when smeared thick on toast and grilled. This is our signature product. We grow all of our Trout on site in the pure crystal spring waters of the Tillingbourne. Whose waters provides our fish with an abundance of natural foods. 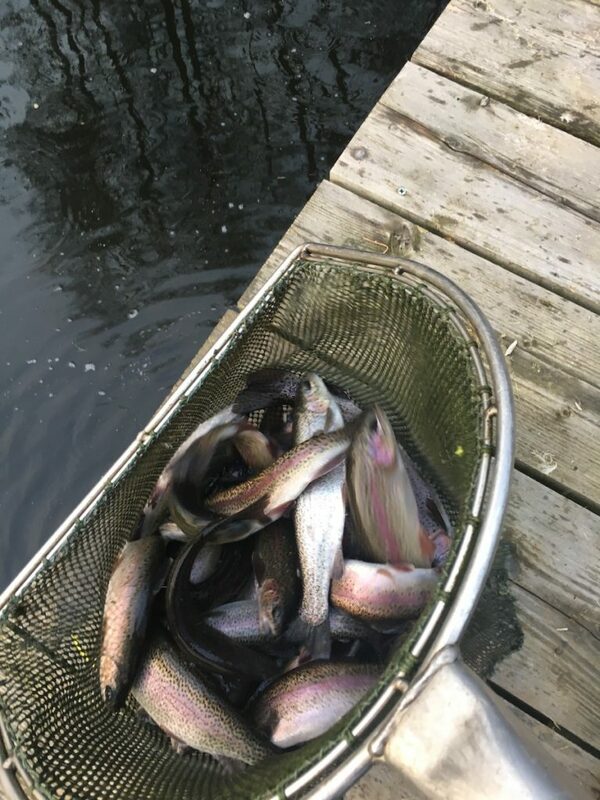 Growing Trout in such perfect conditions really does pay dividends and you can taste the benefits in the flavour of each fish – you won’t find a earthy hint in our product. 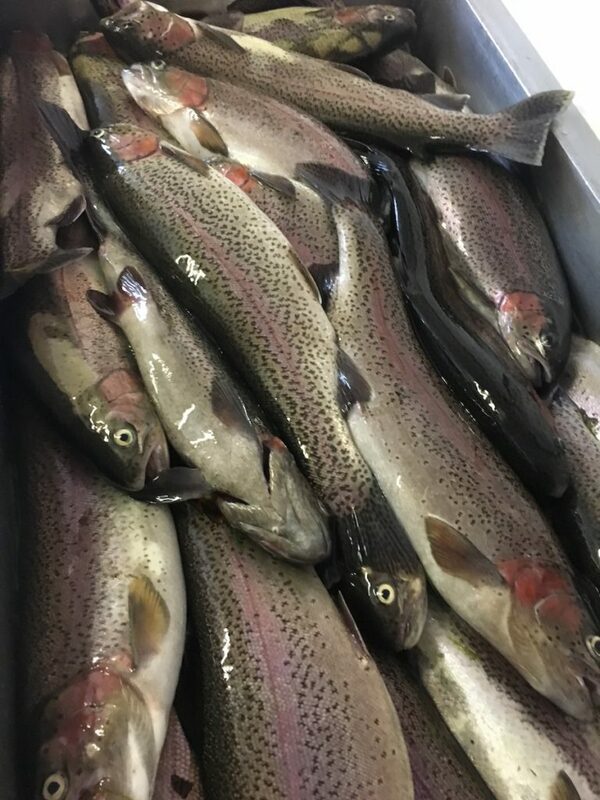 Each Trout makes the short journey from the fish farm to our on site processing rooms, where they are prepared and brined in a simple salt water solution. We then hot smoked them over selected oak and ash logs to perfection. 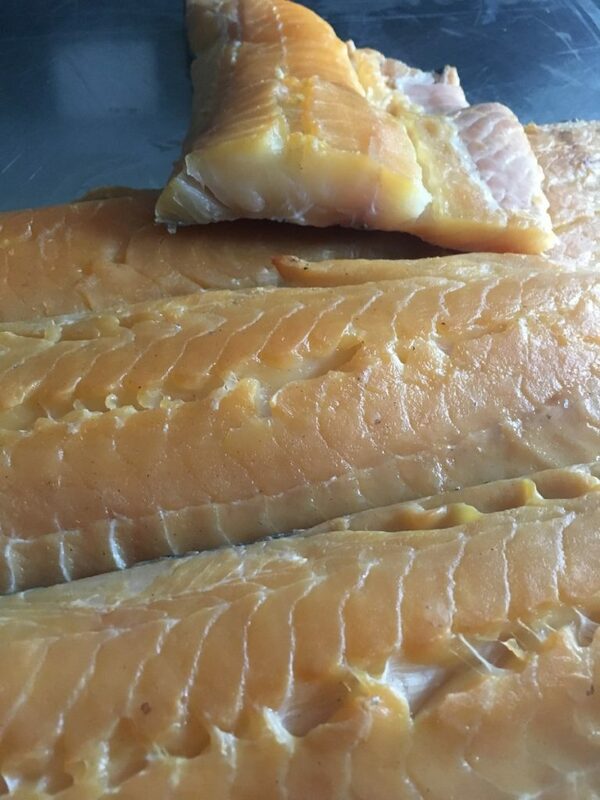 Our Trout is available as a whole fish straight from the smoker, or filleted and boned. We vac pack all Smoked Trout products to retain the freshness and flavour. We also make our signature Smoked Trout pate’ out of our own farm stock. In addition to our Smoked Trout, Fresh Trout can also be purchased straight from the water, where we dispatched each fish as required. We stock a large range of frozen seafood at Tillingbourne. We virtually sell anything, we have a motto if it swims, we sell it. You will typically find products like: Sardines, Whitebait, Tuna, Salmon, Cod, Haddock, Plaice, Prawns, Scallops, Squid and much more in our freezers. We have a theory that if fish are caught processed and frozen quickly, when thawed they will taste just as good as when they were caught fresh. You will notice that most of our frozen products are IQF, this stands for Instant Quick Frozen – the processing plant’s method of quick freezing fish and shellfish, so they don’t dry out and retain all of their original moisture. We have a good relationship with the day boats and various UK fish markets, enabling us to obtain fresh fish straight from the coast if you require. This is an order only service – feel free to give us a ring and check which products are in the season and the current prices.